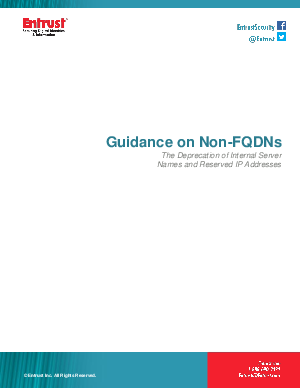 The use of non-FQDN certificates is being deprecated by November 1, 2015, and existing certificates containing non-FQDN names will be revoked by all public CAs by October 1, 2016. Per the CA/Browser Forum’s latest Baseline Requirements, publicly trusted SSL certificates that use non-registered domains represent security vulnerabilities in the SSL trust chain. This white paper explains the change, reasoning behind it and suggests alternatives for affected subscribers. Entrust provides necessary definitions, a background on the issue, frequently asked questions and current usage. To learn more, download this whitepaper. Compliment of Entrust.